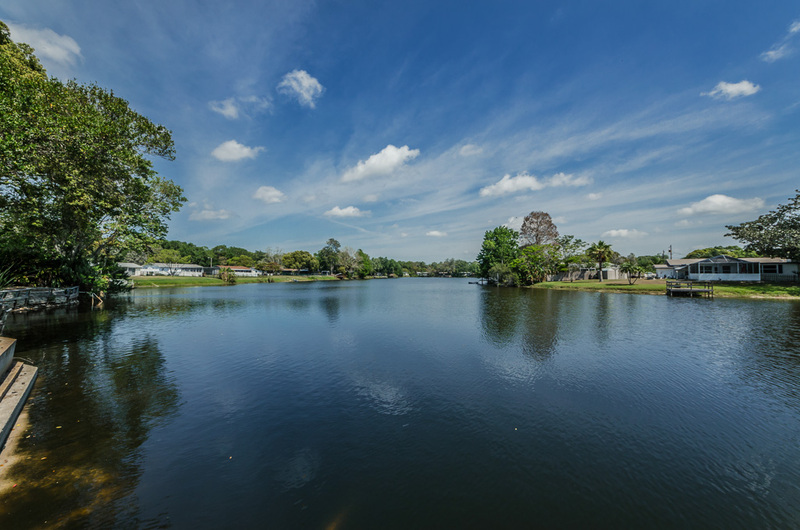 In picturesque New Port Richey, you’ll find this waterfront home on shimmering Cedar Lake. The tiled sunroom with private entrance offers exquisite vistas, while the yard includes a uniquely pavered patio and fencing with flowering hedges along the seawall’s perimeter. Vertical edging stones define the flower beds bordering the home, ready for native shrubbery or a robust herb and vegetable garden. Inside, you’ll find a distinctive floorplan that offers the openness of a contemporary layout, with just the right touches of partial walls to lend a coziness to each room. Immaculately maintained, easy care laminate flooring runs through both large bedrooms. The eat-in kitchen is quite spacious featuring an inviting breakfast nook and convenient breakfast bar to enjoy casual dining and leisurely morning coffee. An oversized doorway from the breakfast nook and the kitchen’s serving port transition into the adjacent, sunny room. Currently used as a formal dining room, it could also serve as the ideal family room, with its gleaming sliders to the outdoor sunroom. The front of the house boasts a lovely living room with views straight through the home to the water. Nestled in a quiet neighborhood with state parks and the Gulf of Mexico to the west; and the shopping and fine dining of Trinity to the south, this home is wonderfully situated for the best the area has to offer. With the half bath in the garage to create the perfect workshop, this house is being sold completely furnished and ready to become your home. https://trinityeastlakerealestate.com/wp-content/uploads/2018/03/LC-WebLogo-340x156-300x138.png 0 0 loricrawford https://trinityeastlakerealestate.com/wp-content/uploads/2018/03/LC-WebLogo-340x156-300x138.png loricrawford2017-04-13 14:57:342017-04-13 14:57:34WATERFRONT HOME UNDER $120K!